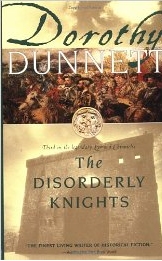 The Disorderly Knights is the third novel in Dorothy Dunnett’s rousing Lymond Chronicles series. I previously reviewed the first two novels, The Game of Kings and Queen’s Play. Upon his return to Scotland from his adventures in France, Francis Crawford of Lymond establishes a small fighting force of independent knights and begins training them. As their reputation spreads, the band begins to attract more knights, and he hears that they are to be joined by a renowned fighter, Sir Graham Reid Mallett, Knight Grand Cross of the Order of St. John. Many of the men who know Reid Mallet consider him almost a living saint. In disposition and talents he seems to be a perfect foil for Lymond, but they clash, and some of Lymond’s men begin to turn against him. As usual, Lymond’s behavior appears to put him in the wrong, and Reid Mallett seems to want to usurp the fighting force. This conflict eventually leads to Malta, where Lymond arrives just before the Ottoman Turks attack. During the siege, Lymond becomes involved in the political maneuvering and feuds among the various national factions of the declining Order of St. John. He also hears that Oonagh O’Dwyer, the beautiful Irish rebel he encountered in Queen’s Play, is captive in another city on the island. After the siege, he follows her to North Africa in an attempt to free her. It is difficult to write more about this novel because of spoilers, but also because the plot becomes increasingly complex from this point on, with threads that are not all explained until the sixth book. Suffice it to say that, although this is a slow-starting series, if you get this far, you will be hooked. The novel is suspenseful and exciting, and Lymond makes a complicated and compelling main character, almost an anti-hero at times. These books were written in the 1960’s and 1970’s, and I think the only series to compare with them might be George R.R. Martin’s Song of Fire and Ice or Dunnett’s own House of Niccolo series. Next Article Special Post! Best Book of the Week! Interesting take on Dunnett, Kay — I’ve been in love with Lymond for years and I know what you mean about the sweep of these books. But I think good and evil are much more mixed in the Martin books. This is one series I’ve read often enough to actually wear out. Almost time for a new go-round! I also love Martin’s series, although I think he does a similar thing with his characters to what Dunnett did with Lymond. He is not a nice person and sometimes appears to be doing evil. Even though she shows us time and time again that he has better motives, she still tricks us into thinking he is behaving beyond the pale. Martin is, perhaps, mixing good and evil in the same person, which is a little different.